Aashayein, the first-ever exclusive event for dialysis patients, held recently in Hyderabad was a huge success! For the first time, 300 patient with a similar set of problems gathered together under one roof and talked to each other, heard people talking about their problems and most importantly - had fun. The event kicked off with a welcome address by Vikram Vuppala, MD, NephroPlus, a chain of dialysis centers, where he described how we came up with this idea. Kamal D Shah, the MC of the event, introduced the Hyderabad Kidney Foundation (HKF), its objectives and the plans and then invited the father of Nephrology in Andhra Pradesh, Dr. Gopal Kishen and Joseph Rajshekhar, on dialysis for the last 18 years to formally launch HKF by lighting the lamp. Then there were a few talks by Dr. Gopal Kishen, Joseph Rajshekhar, Dr. Sree Bhushan Raju, Senior Nephrologist at NIMS, Dr. Krishnan, Senior Nephrologist at Apollo Hospitals and Dr. Haritha Shyam, Chief Dietician, Apollo Hospitals. Madhur Deep, a transplant recipient shared his experience on getting a transplant. Srinivas Perisetty, husband of Monadipa who is on dialysis gave his perspective on how the family of someone afflicted with kidney disease should cope with this. There was also a Yoga demonstration on some simple but beneficial breathing techniques. Every talk was interspersed with some entertainment for the patients. There was a mimicry show by Mimicry Hari Kishen, himself a dialysis patient who had the patients in splits with his jokes relevant to people on dialysis, a definite first in India! There was a skit performed by dialysis patients called 'The 7 o' clock shift' which poked fun at the various little incidents that happen in a typical shift in a dialysis unit. Some 'antakshari' type questions were also organized for the audience with a prize for each question. The lunch was an elaborate renal friendly affair. Patients could eat everything on the menu for a change without worrying about how much salt it had or whether the vegetables were leached. There was a role reversal of sorts. 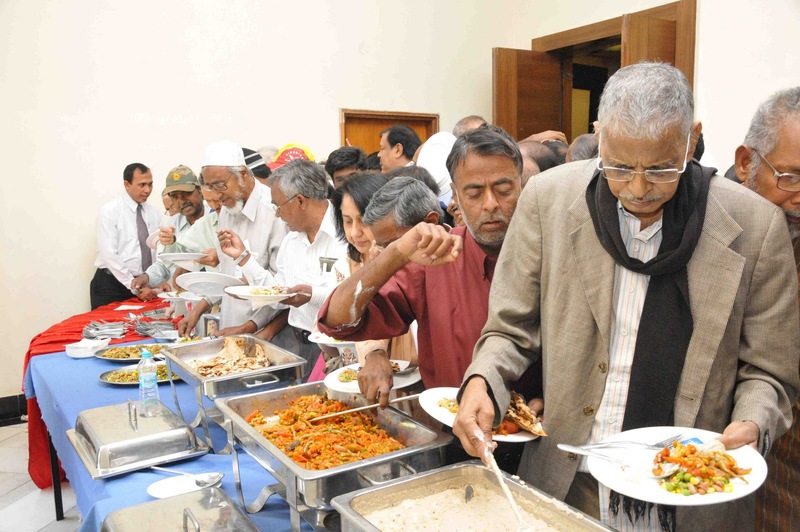 Caretakers had a very simple menu - biryani and raitha whereas patients had a very elaborate menu! After all it was their our day! A simple lunch for caretakers! After lunch the winner of the best fistula contest was announced and then some patients came and presented their talent. Some did songs, some did jokes. In the end there were two rounds of Tombola. Every patient was given out a bunch of goodies which included injections, a bag customized for dialysis sessions and other stuff mostly relevant to dialysis patients. Dr. Reddy's Labs sponsored this event along with NephroPlus and full credit to both the sponsors for making this happen.